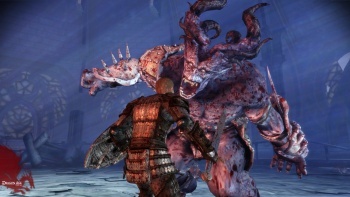 Dragon Age: Origins Reigns Supreme as Best-Selling BioWare Game. Never mind space battles, lightsabers and robots; apparently what gamers really want in their BioWare games is blood splatter and dogs. BioWare's reputation as a maker of excellent RPGs is well deserved, having created classics like the Baldur's Gate series and Knights of the Old Republic. But despite this long pedigree, it seems that BioWare's most commercially successful game is in fact last year's Dragon Age: Origins, a game it expected to have little mainstream appeal. "Dragon Age was an extremely successful title for us - last November it was the single most globally successful title we've put out to date," said Rob Bartel, BioWare's principal designer. "This is one of our two primary IPs in the Edmonton studio in Canada, and then we're working on the Old Republic down in Austin. So Dragon Age is a very big part of what we do and for what the future for BioWare will hold for sure." There are no doubt plenty of reasons you could think up for why Dragon Age has done so well, but a big part of it must surely be the fact that it's the first BioWare game in nearly ten years that has been available to PlayStation owners. Mass Effect, Knights of the Old Republic and Jade Empire were all initially released on the Xbox or Xbox 360, with PC versions coming later. Dragon Age: Origins, on the other hand, was designed to be multi-platform from day one. Considering the PS3 represents an audience of tens of millions that was previously untapped, Dragon Age's success makes a lot of sense.